Intended specifically for the purpose of pulling apart. Some of the brass/projectiles may be unusable after pulling apart (extras always included). 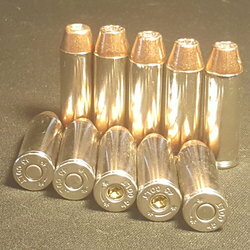 These rounds are PERFECT for all the reloaders out there. Pull them apart to reuse the brass and the projectiles. The components are good (brass & projectiles) but the powder may vary, the primers might be seated sideways, upside, or not at all, and the rounds could have some minor dings or dents. Customers purchasing this product must sign a liability document regarding this live ammunition. Just received order for 9mm and 223/556 cases. Very happy with order. All the 9mil cases are usable just had to sort out the very few mil cases out of the bunch to do a primer pocket swage. The 223/556 are very clean and look good to boot. There were a few more of them that are mil load so those will go into the sort box for swaging too. No complaints here and very happy with the order. Thank you for the quick order and will be back soon for additional items. Thought I would give DiamondK a try - and I'm glad I did - ordered the Mixed Commercial 223/556 200+ brass only. Product was shipped quickly, 204 Pieces were packaged. The brass must have been washed - it was very clean - This was an unexpected surprise. Mix of 223 to 556 was about 50/50. I''ll be back to Diamond K for my next reload project. Recently purchased 1000 rds of .223 with primers and 100 rds of 357 brass. Great service, great price and even better product. Only about 20 of the .223 brass was not military spec brass. Will buy all of my primers and brass from these guys. I have done business with Diamond K for years, started in 2008 after the presidential election. Quality products fast shipping and very reasonable prices for the high quality. You can not go wrong. They even e-mailed me once t o want to know if I wanted to fill the of because of a special, and I said yes. Quick shipping, and just as the ad described. Super co. to buy from. Will use again. Better Deal, they make the process quick and easy. I seem to always be back here after looking around. Thanks D-K! This place is the best. No issues with anything on any of my 3 orders and super fast shipping. Great product, price, and shipping... Thanks again DKB will return very soon.